While I can’t eliminate laundry from your to-do list, I can help you save money on laundry with these frugal laundry tips. 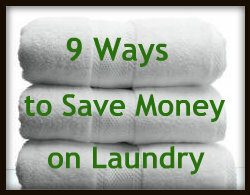 Laundry can be as expensive or as inexpensive as you want it to be. Not all tips are right for every one; just choose the ones that will work for you and enjoy lower utility and laundry supply bills! Here are 9 different ways to save on the cost of doing laundry, ranging from quick and easy to long-term solutions. Enjoy! 1. Buy Energy Star rated appliances. That Energy Star emblem means they use less energy therefore it will cost you less to use. When replacing old or worn out appliances, check for the Energy Star rating when making your replacement choices. 2. Cut dryer sheets in half. One box lasts twice as long when you cut the sheets in half. As soon as you buy the box, break out the scissors and cut your dryer sheet expenses by 50%! Or you could use each dryer sheets twice, this works just as well with less work! 3. Use correct amount of laundry detergent. Be sure to read and follow the recommended amount of detergent for your size load. Detergent caps are misleading! Often they will have 4 or 5 lines but only require detergent for the first line or maybe the second for a large load. 4. Use less detergent and liquid fabric softener. You can usually get by with using only half of the recommended amount without sacrificing performance. Give it a try! This works great even on heavily soiled garments. 5. Clean the lint trap before every load of laundry. A clean lint trap lets your dryer work more efficiently and dry clothes faster. Spend an extra 20 seconds and empty it before you start the dryer. Every 3 months scrub your lint trap with soap and water to eliminate invisible dryer sheet residue. Your dryer will run more efficiently and a clean lint trap cuts down the risk of a dryer fire! 6. Line dry your clothes. Hang items to dry outside or inside over store bought racks. Personally, I don’t use a dryer for undergarments (they’ll last a lifetime longer and hold shape better if you don’t! ), nice shirts or sweaters, & t-shirts with large print on them (they will crack & look older faster if you dry them). 7. Do less laundry. Wear jeans several times before washing, use bath towels more than once (change wash cloths daily). Sweaters and jackets easily be worn more than once if you wear them layered with a shirt underneath. 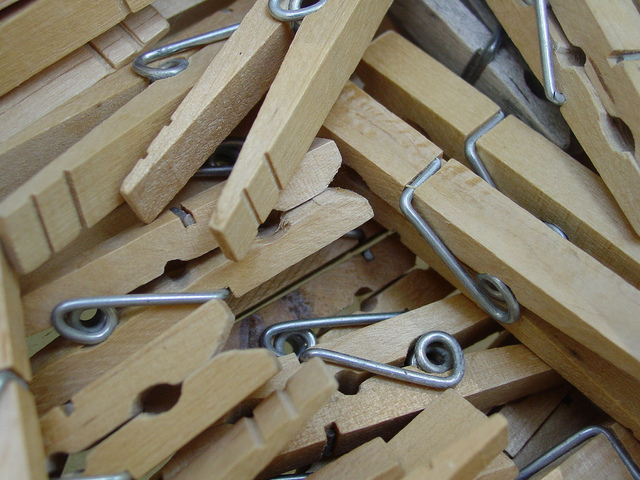 Make sure you hang up clothes that can be worn again so that they’re not wrinkly or washed by mistake. 8. Dry loads back to back if possible to keep the dryer from heating up again (save time and energy). 9. Wash in the coldest temperature recommended for your clothes. Save your water heater energy when possible. Cold water temperatures are proven to clean just as well as hot and will also help to preserve the fibers of your clothing so it won’t wear out as fast. We recently had a problem with our dryer working well so we had to have a repairman come out to fix it. It needed a new part but the guy also took the lint trap to the sink and turned the water on over it and all the water pooled up on the surface instead of running through it like it should. It looked perfectly clean but there was build up on it and was making it hard for air to circulate. The repairman said that fabric sheets are terrible on your dryer because they leave this film on your towels and make them less absorbent and also the film clogs your filter. Never knew that. I still use dryer sheets because I don’t care for liquid softener but now I cut our sheets in half though. He scrubbed the filter with a sink brush and the water started dripping right through it. He said to do this one a week at least. Use 1/4 to 1/2 cup vinegar to soften and remove mineral deposits and soap build-up instead of dryer sheets. My lint trap is nice and clear and less toxic waste goes into our water supply when you go green. your grandchildren will thank you. that film on your towels touches your face and skin every time you use those towels. Ha! You beat me too it! I just took pictures of my lint trap pooling water this week for an upcoming post. Your repairman is absolutely right! Summertime-use hand towels to dry off after a shower or bath, especially in the summer.The smaller towels work just as well and are less expensive to launder. Also, because they are 1/3 to 1/4 the size of bath towels, you can use a fresh one daily and still have smaller loads. make your own laundry soap-better for you and the environment. Use vinegar for softening clothes. Laundry bar soap rubbed directly on area-Zote, Lirio, Fels Naptha are excellent stain and dirt removers and safe for you and the earth. they can also be used to wash dishes, clean your house instead of those expensive and dangerous all purpose cleaners. these soaps can be purchased at “ethnic” stores and Shop Rite. starched shirts repel body soil and dirt allowing you to wear your dress shirts an extra day and save on dry cleaning and laundering saving the earth, your pocketbook and gas to go. Wow what great tips. Some I knew and some I would not have thought of doing, like cutting your dryer sheets in half. That’s a great tip. Some great tips, thanks. I’m going to try using less detergent and see how that works out.